Located in Manhattans most authentic neighborhood, Hotel on Rivington places you in the center of the hip and historic Lower East Side. Guests are in easy walking distance to popular NYC neighborhoods such as SoHo, Tribeca, East Village, Chinatown and Little Italy in addition to some of the most diverse and energetic nightlife New York has to offer. . 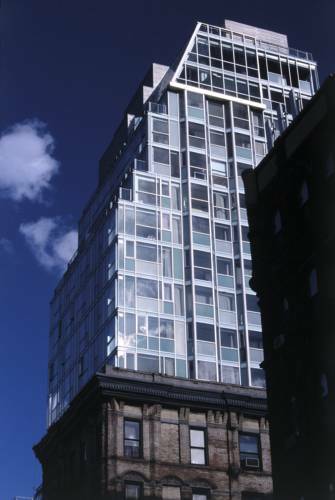 Constructed of floor-to-ceiling glass exterior walls, most guest rooms and suites feature breathtaking Manhattan views. A wide selection of premium room features include balconies, Japanese inspired deep soaking tubs and exterior facing steam showers. . All rooms offer premium Tempur-Pedic beds, soft Frette sheets, plush Italian robes and luxury bath amenities by Davines. Deluxe minibars, flat screen televisions, iHome stereos and complimentary WiFi are all standard amenities in each of our guest rooms. . Hotel on Rivington is also home to cafe medi and jia lounge downtowns latest buzz-worthy restaurant and Lounge. Breakfast Lunch dinner and brunch are served in cafe medi located on the ground floor offering an a-la-carte menu from 7am-11pm 7 days per week. Hotel on Rivington is located on 107 Rivington Street between Essex and Ludlow Street in downtown Manhattans hip and historic Lower East Side and walking distance to SOHO, Tribeca, East Village, Chinatown and Little Italy. All Reservations require a valid credit card guarantee due at the time of booking. Reservations must be cancelled by 4pm 48 hours prior to arrival to avoid a penalty of one nights room and tax charge. Open Monday - Sunday Breakfast 7am - 11:30am lunch 12 - 5pm dinner 5:30pm -11:30pm Coastal Mediterranean cuisine and Crudo bar with skylit main diningroom and sidewalk patio. many gluten free choices. Located on the ground floor of hotel on Rivington. Open Tuesday Saturday After 10:30pm admittance at doorpersons discretion. - Levi strauss and co.